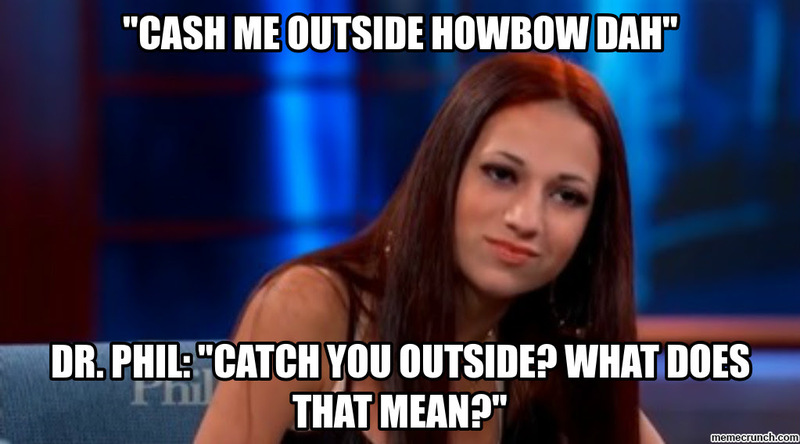 Chances are in the last week you’ve seen or heard this phrase or some variation of it: cash me ousside, how bow dah? Where did it come from? It all started with a viral clip that was uploaded to the Dr. Phil show YouTube account in September 2016. 13-year-old Danielle appeared on the show alongside her mother. She had a propensity to steal cars, get into physical fights with her caregivers. As the live studio audience giggled in unbelief at her absurd manner of talking to her mother and Dr. Phil, the girl called the audience members “hoes,” and famously challenged them to meet her outside to fight her if they had any issues with that— in her own unique way. It’s not really known why it took the viral video 4 months to travel from YouTube viral hit to meme hall of fame, but I’m sure glad it did.